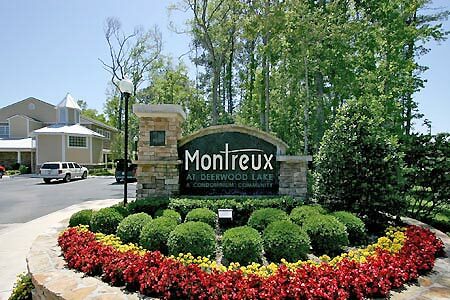 Montreux at Deerwood Lake condominiums in Jacksonville, Florida. 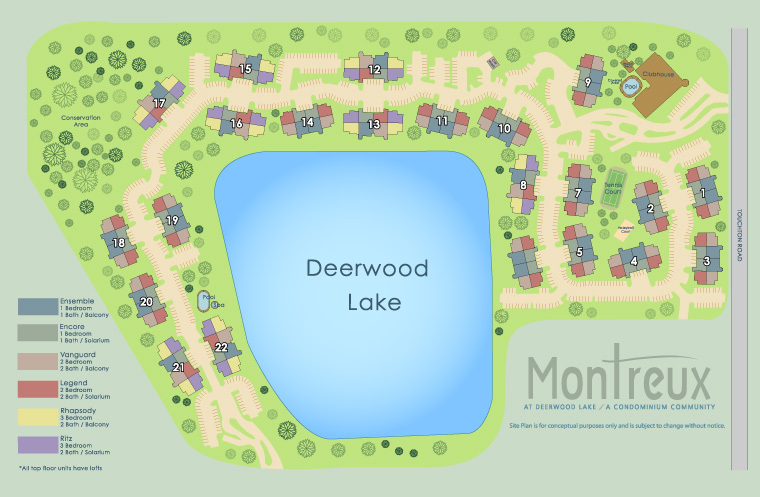 Montreux at Deerwood Lake is a 444-unit condominium project by Tarragon South Development Corp. in Jacksonville's highly desirable area. Only minutes from fabulous shopping, dining, entertainment, and the renowned Jacksonville beaches, Montreux at Deerwood Lake places you in the center of all the action at a price that's music to your ears! Click to see community site map. Built in 2003, Montreux consists of two- and three-story buildings, each of wood-frame construction with a cement siding and stone exterior finish, complemented by a hip-style, gabled, architectural asphalt shingled roof. Montreux offers large 12 floor plans featuring 1, 2, and 3-bedrooms, some with optional solariums, balconies, and lofts. Garages available for purchase. All unit has nine-foot ceilings and pre-wired for surround sound and high-speed Internet access. Condo fees include water, sewer, maintenance of amenities and common areas. Perched on the shore of picturesque Deerwood Lake and accented by colorfully lighted fountains, the well-appointed property features an elegant clubhouse, two resort-style swimming pools and spas, dry rock/cedar sauna, business center, a state-of-the-art fitness center, billiards room, theater/multimedia presentation room, club room/bar area with wide screen TV, sand volleyball, lighted tennis court, air-conditioned basketball court, picnic area with BBQ grills, car care center, lakeside pavillion with sunning deck, and a park-like setting. Revel in the luxuries and amenities that are redefining what it means to live. Montreux is located next to a brand-new Publix-anchored retail center that offers every neighborhood shopping convenience and across Southside Boulevard from the Tinseltown Entertainment Complex, which features an exciting variety of dining and entertainment offerings. Montreux is just minutes north of St. Johns Town Center and The Avenues Mall, where nearly every major retailer in the area co-locates, providing every shopping convenience imaginable. Immediately north of J. Turner Butler Boulevard and just off Southside Boulevard near Interstate 95, Montreux is near many major employers in the Southside market. Residents have easy access to both the Beaches area to the east and downtown to the west.